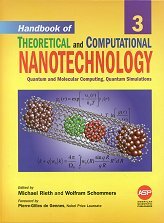 Handbook of Theoretical and Computational Nanotechnology. Michael Rieth, Wolfram Schommers, eds. Quantum and Molecular Computing, Quantum Simulations.